Newstead and District Swimming Pool is a seasonal pool open from December to March. 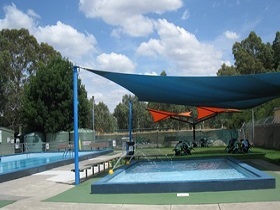 The pool is open for recreation water play, lap swimming and water activities. Previously managed by Newstead and District Swimming Pool Incorporated, in 2018 the management has changed over to the Bendigo Regional YMCA Youth Services Incorporated. Newstead and District Swimming Pool is now closed. Keep up to date on opening times and activities with Bendigo Regional YMCA Youth Services incorporated on Facebook or via their website. For details on the following programs please contact Bendigo Regional Youth Services Inc. The Bendigo Regional YMCA Youth Services Inc. manages and operates the Newstead Swimming Pool on behalf of Mount Alexander Shire Council.